. . . PS-Soft Development Page - a file format converter tool . . . 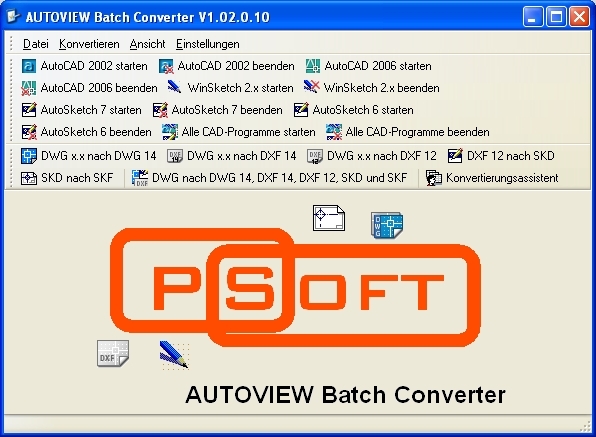 The AutoVIEW Batch Converter is a file converter utility for converting all kinds of AutoCAD .dwg-files (completely independent of the file version, only depends on the AutoCAD version installed on the system). It uses OLE automation and windows message sending to control the software on the installed PC. To do the full work it needs at least AutoCAD 2002, AutoCAD 2006, AutoSketch 6, AutoSketch 7 and the old WinSketch 2 to be installed. AutoCAD products are controlled by using OLE automation. To do this on you own have a look at the Embarcadero Developer Network (formerly known as the Borland Developer Network or Borland CodeGear). It's also possible to do the same directly in AutoCAD using VBA (Visual Basic for Applications) which is integrated. Unfortunately this method doesn't work with applications that don't have an builtin OLE interface. So there's only the workaround of doing simple message passing using API function calls simulating mouse clicks and keystrokes. Therefore you'll see a configuration dialog on the screenshots page to configure breaks between the operations 'cause you always have to wait 'till the controlled application has finished work. It was a challenge controlling the two different versions of AutoSketch. They seem both to be MFC applications coded in C/C++ and therefore don't use a constant class name. So if you use FindWindow or other API functions it's pretty hard to identify uniquely. The only way was to start one version first, check for the window to get the handle and then start the other version. So the file converter is able to do all kinds of conversion (as you can see on the screenshots). After a long time of testing it's in use since quite a long time and saving lots of work according to the book. last update: 2010-11-16 - 19:40:59. The batch converter topic was visited 2770 times.